Athlete’s foot, medically known as tinea pedis, is one of the most common skin infections that affect your feet. If you have redness, soreness, and tenderness between your toes, it’s time to visit the podiatry team at Great Lakes Foot and Ankle Institute PC to see if you have athlete’s foot. You can either call the Chesterfield, Clinton Township, Fort Gratiot, East China Township, Shelby Township, or Rochester, Michigan, clinics directly to book, or click on the online scheduling feature. How did I get athlete’s foot? Picking or scratching at an untreated athlete’s foot infection can cause it to spread to other areas, including your hands and nails. Make sure you know the signs and symptoms of athlete’s foot, so you can get it treated before the condition worsens — or spreads to someone else. Since athlete’s foot can sometimes be mistaken for eczema or even very dry skin, it’s important to seek medical attention to get a proper diagnosis early on, rather than trying to treat the condition on your own. Is there a treatment for athlete’s foot? Yes, and your podiatrist thoroughly diagnoses you before starting your athlete’s foot treatment. 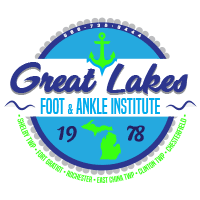 Your athlete’s foot appointment at Great Lakes Foot and Ankle Institute PC begins with a thorough examination. Usually, your podiatrist can diagnose athlete’s foot on the spot, simply by examining your rash. Occasionally, though, skin scrapings — which are evaluated under a microscope — can help confirm an athlete’s foot diagnosis, while ruling out other conditions. The team at Great Lakes Foot and Ankle Institute PC even counsels you on how to prevent future athlete’s foot outbreaks, since once you’ve had it, your chances of becoming infected again are higher. The team at Great Lakes Foot and Ankle Institute PC can help you get through an athlete’s foot outbreak right away. Schedule your visit online or over the phone with your nearest clinic.